Who says you can’t put together homemade baked goods in a flash? 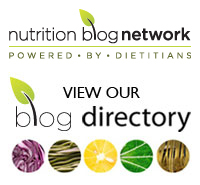 It’s March and the annual Dietitians of Canada’s Nutrition Month. “Simply Cook and Enjoy” is the theme this year. So why not get the family involved and whip up some healthy treats? Here’s an old family favourite from my book, The Enlightened Eater’s Whole Foods Guide, which contains a variety of nutritional superstars. Look for whole grain whole wheat flour, if possible. Sift together the first six ingredients in a large bowl. Stir in the sugar, wheat germ and ground flaxseed; mix well. Beat the eggs, oil, and mashed bananas together in a medium-sized bowl. Pour into the centre of the dry ingredients and stir only until the mixture is moistened. Stir in chocolate chips. Pour the batter into a lightly greased and floured 9 x 5 x 3 inch/2 L loaf pan. Bake at 350°F /180°C for 50-60 minutes or until a toothpick inserted into centre comes out clean. Cool for 10 minutes, then remove from the pan. Cool on a wire rack. 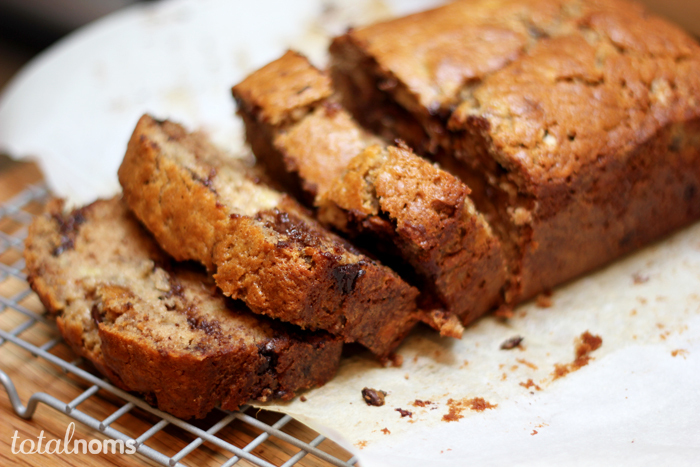 Do you make banana bread? What are your favourite additions? Please share in the comment section below. Sorry, Deborah. It was supposed to publish tomorrow but I will put it back up. The hazards of WordPress! Could I replace the sugar with applesauce ? Paula, I would start with substituting a small amount of applesauce and seeing how the texture turns. If it is to your liking, then increase the amount of applesauce again. Let me know how it turns out.